Edward Lock was was baptised on 20 August 1730 at St Edburgh’s Church, Bicester, the son of Edward Lock senior. His mother is likely to be Mary Bennet of Kettleton, who was married to an Edward Lock there on 29 March 1713. Seven other children of Edward Lock senior, probably his siblings, were also baptised there: William (1714), Mary (1716), Elizabeth (1717, buried the same year), Sarah (1721), John (1724), Elizabeth (1727), and Anne (1734). Edward served his apprenticeship in London, and then came to Oxford to work with the goldsmith John Wilkins at 135 High Street in All Saints parish. When Wilkins retired in 1759 his widow Catherine Wilkins took over the business, and in 1759 Edward Lock took it over from her. Joseph Lock (born on 13 April 1760 and baptised at All Saints Church on 17 April 1760). Lock was admitted a Freeman of Oxford by Act of Council on 2 February 1660. On 30 September 1762 he was chosen by the Mayor, Anthony Weston, as his Child, which meant that he could immediately be admitted as Chamberlain. In 1764 he was appointed Keykeeper and in 1766 Senior Bailiff. In 1771 he was appointed to a committee to settle the value of the city interest in its houses as a consequence of the Mileways Act. By the time of the 1772 Survey of Oxford Lock's shop occupied the western part of the present 7 High Street, also in All Saints parish, which had a frontage of 6 yards 2 ft. 3 in. On 3 May 1776 Lock was appointed one of the Mayor’s Assistants and on 30 September 1776 was elected Mayor (for 1776/7), nominating John Parsons as his Child. As well as his council activities, Lock subscribed to the building of Botley Causeway, gave financial support to the Radcliffe Infirmary, invested in the Banbury to Oxford stretch of the Oxford Canal, and was Treasurer of the New Oxford Provident Society. He also served as a magistrate, and when a certain Lucy Bennett tried to sell him a silver spoon, he had her arrested: it transpired that she was the daughter of the butler of Worcester College, and that other spoons were missing: Lucy was transported for seven years. Lock took on Thomas Jackson as an apprentice in May 1768, his own son Joseph in April 1774, and John Davis in December 1784. His shop was much frequented by Parson Woodforde during his time in Oxford. Bailey’s Western & Midland Directory for 1783 lists Edward Lock and Son as Goldsmiths and Jewellers in the High Street. In 1787, the year that his wife died, Lock purchased his shop and home (now 7 High Street) from the Commissioners of the Mileways Act when part of it was to be pulled down to the widen the street. 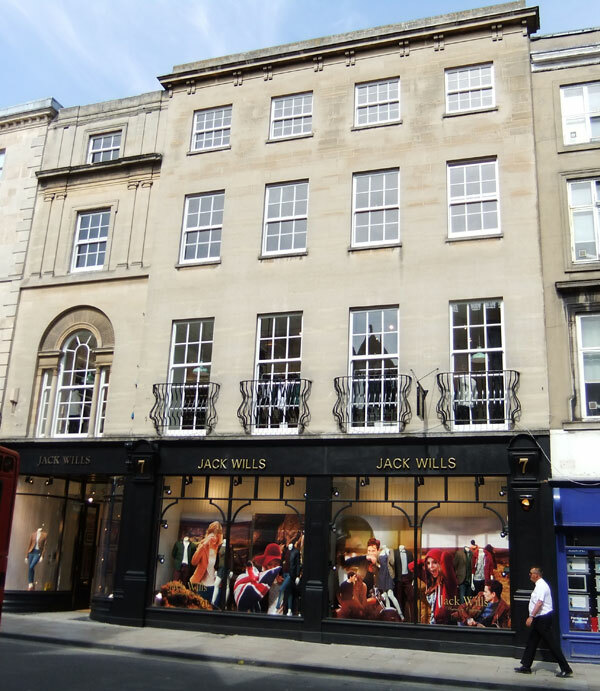 In the 1790s he became a partner in a new bank which opened in his shop until the possession of the adjoining house at 6 High Street could be obtained: this later became the University & City Bank. In 1791 Lock was elected Mayor a second time (for 1791/2). In 1801 Lock lost the struggle with a rival banker and Mayor of Oxford, John Parsons, for the position of Alderman (said to cost each of them £400), but just one year later he was given an Alderman’s place as well. In 1806, at the age of 76, he stood in the mayoral election against Parsons, and this time was elected Mayor of Oxford (for 1806/7). On Thursday morning last died, after a few days illness, in the 84th year of his age, Edward Lock, Esq. one of the Aldermen of this city. He was appointed to a Chamberlain's seat in the Council in 1762; elected Bailliff, with Jabez Jagger, in 1766; one of the eight Assistants, in the room of Mr. Thomas Tredwell, 1776; Mayor in the same year, and again in 1791 and 1796; and, on the death of George Tonge, Esq. in 1802, was elected Alderman. He was a man of the strictest integrity, and for many years a most active and useful Magistrate. He left his sister Mrs Elizabeth Pavior four shillings a week during her natural life provided that she remained widow, and everything else to his son Joseph.